You’re in the mall passing the florist and think to yourself, there must be a Bracha for such wonderful smells. Later, you visit the hospital and your feet pull you into the coffee shop just to enjoy the smell. Which Bracha should you make? 1 Borei atzei besamim (or more correctly vesamim) is similar to a borei pri ha’aitz for foods. It is made on any nice smelling inedible substance that grows on trees. 2 Borei isbei besamim (or vesamim) is similar to a borei pri ha’adama for foods. It is made on any nice smelling inedible substance that grows on the ground. 3 Borei minei besamim (or vesamim) is like the Bracha shehakol… It is intended for nice smelling substances which don’t grow on trees or the ground (mushrooms are borei minei besamim). It also serves as a “catch-all” Bracha for all mixtures, sefeikos (hence Minhag Ashkenaz by Havdala to always use this Bracha) and covers all mistakes. 4 Borei shemen areiv is a special Bracha for balsam and balsam oil. 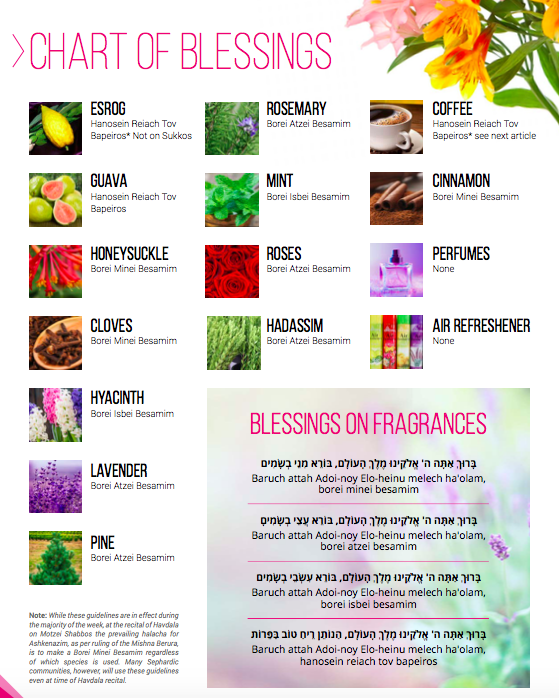 As it grows abundantly in Eretz Yisroel it has a Chashivus (preference) over all other smells giving it its own Bracha. 5 Hanosein reiach tov bapeiros is a special Bracha for food which grow on trees or the ground, smell nice, and are taken with intent to smell. 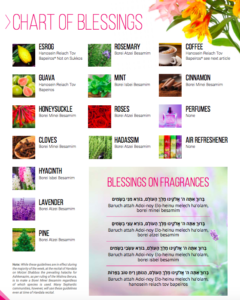 These Brachos are only said when doing an action to access the smell and so you would have to enter the florist or coffee shop to make a Bracha. The Bracha on freshly ground hot coffee is Hanosein reiach tov bapeiros. Flowers are a mix of atzei and isbei resulting in a Borei minei besamim.